The finish of the watch was nice though, and the bezel wasn’t as clunky as I though it would be. However, this is a large(!) watch. It is certainly bigger than my 44mm Panerai. The bracelet was (except for the minor detail on the endpiece) nicely crafted as well, I think they call this the pilot-bracelet. I didn’t ask what movement would be inside, to prevent myself from hearing more rubbish. I left the store with a nice Breitling for Bentley brochure and mixed feelings about the watch (and store). The store was all-white on the outside, and quite ‘clean’ on the insite. The wall was full with pictures of famous Dutch people that paid the store a visit. Not people I would want to be seen with though, but I guess certain customers could be attracted to this. If they watch soap-series that is. 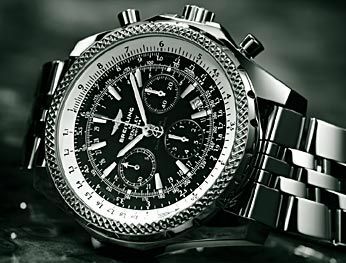 Breitling is a brand that doesn’t do it for me, except for their Navitimer range. I love the vintage ref.806 models and I kinda like the new ones as well with the tri-compax layout (that’s subregisters on 9,3 and 6 o’clock). This one was a bit too big for me (and I am not a small guy) and I wonder why someone would want to wear this piece. I have large wrists, but someone who wants to wear this have to consider a Panerai as ‘normalsize’. Is it ‘da bling’-factor or do they really think they get something special at 6000 Euro? Oh, I don’t know and frankly, I won’t give it much more thoughts than the one I just wrote here. Next!